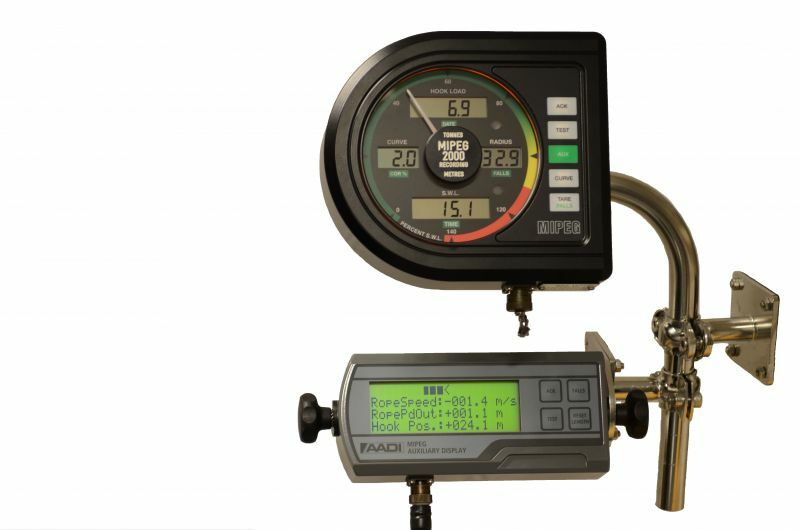 The Mipeg 2000 Safe Load Indicator and Crane Monitoring System has been designed to provide crane operators with the necessary information to meet all known world wide Government requirements for crane safety. Additionally the monitoring feature provides the vital information needed to enter a planned maintenance schedule based on crane usage. The logged data may also be used in incident investigations. The system comprises load and overturning moment (optional sensors) together with an angle sensor all mounted on the crane structure. A micro computer calculates the sensor data and provides a clear image of the crane utilitsation on the operator's display. The crane´s utilisation is automatically compared with the crane design parameters permanently stored in the Mipeg's memory and outputs to inhibit or to be used in the crane control system are generated. The system includes a self-diagnostic facility to identify any system irregularities. A standard lap-top computer is used for easy calibration, test and service of the unit. The lap-top will also store the crane usage data in its database. The real time logged data may also be analysed using the COREP program. The Mipeg 2000 system is available in several versions, including full and non-recording. The load and moment sensor(s) provide frequency modulated electrical signals which are proportional to the hook load on main and/or whip lines or the tipping moment of the crane. The sensor is certified according to Atex II 2 GD EExd IIB T6 for use in hazardous zone 1 and is compensated for operation in temperatures from -20 to +80 deg C. Signal transmission is immune to electro magnetic interference and the sensor can withstand a ten-fold permissible overload without loss of performance. The sensor is sealed to IP67. The boom angle sensor or inclinometer is a gravity based sensor and is certified according to Atex II 2 GD EExd IIB T6 for use in zone 1 areas. The enclosure is of galvanised cast iron, sealed to IP66. Alarm lights, providing a clear and continous warning indicating that the preset limits, typically 95% (yellow light) & 110% (red light) of permitted load, have been exceeded, are incorporated into the display. Push buttons are provided to change no. of falls, sea condition and to activate test functions and optional features. The unit is certified II 2G EExia IIB T4 according to the Atex standard for use in hazardous zone 1 and sealed to IP65. The microcomputer is housed in a steel box. Easy access to the electronics is obtained through the hinged front door. The box contains the sensor interface, micro computer and solid state circuitry to interface with the display and crane alarm/control intputs and outputs. (Zone 1 version is housed in a galvanised cast iron box). The system will store data for all crane curves and thereby cater for all sea state and reeving configurations. Retention of this data is unaffected by loss of power. The system operates on a 24 V D.C. supply. A power conversion unit for other voltages can be provided to suit customers electrical supply. The unit is sealed to IP66 and certified to II 3G EEx nC IIC T4 for use in hazardous zone 2. (Zone 1; verson is sealed to IP66 and certified II 2(1)G EExd d(ia)IIB T6). Operating temperature for both versions are -20 to +50 degrees C (-4 to +122 degrees F). The MIPEG 2000 combines safety with crane maintenance through the recording facility built into the system. The system records and stores accumulated data from start of operation and data for each individual lift as: Dynamic and static hook load Dynamic and static over turning moment Radius and no. of falls Sea condition and duration of the lift Other operational data as requested. The data is stored in a lap-top PC and using the COREP evaluation program the data may both be used as input to the crane maintenance program as well as incident investigations.